From lethargy awake! : Reflections on IBIZA! Following a week of great fun with college friends, living it large in San Antonio, Ibiza's most lively holiday spot, my body clock has just about returned to normal. The Confort plaza apartments, despite some of the worrying reviews we checked out on trip advisor prior to the holiday, served us well, being basic but amost in the centre of San Antonio's west end, a short walk to the beach, the famous Sunset Strip and all ammenities such as supermarkets selling enormous water melons, bargain price sangria and enough bread sticks to cover breakfast, lunch and dinner. Ibiza itself surprised me with it's diversity. Having done little research beyond checking the existence of our apartments and tracking down the number of the british (just in case!) the week previously, I fully expected the island to be entirely commerciallised and packed full of rowdy, paraletic 18-30s. To be sure, San Antonio's west end is exactly this, the distinctly more tacky, chavvy department, reminding me of the streets of small town Malia we visited last year. We had a few fun nights in the west end, but after a week I think I can speak for all of us growing weary with the workers, always invading your personal space in order to convince you that their bar is better than all the others. That without doubt, the bar they work for is the best place to spend your last seven euros on more alcohol/coloured water than you can feasible drink. Irritatingly there is apparently no market for one, reasonably priced, quality drink with your friends, so I found myself challenged to be patient and polite, particularly in the bar refusing to serve me some lemonade! However, away from the west end, set up to embrace an epic drinking culture, San Antonio gives a far classier experience. I loved Sunset Strip, a path along the shoreline with loads of bars screaming 'trendy overpriced awesome coctails!' Each has it's own section of terrace overlooking the spot rated up there with best sunsets in the world-it's easy to see why! Both tourists and locals fill the cafes, line the rocks, whilst the chill out beats pump and applause follows the sunset. This, along with much more of Ibiza, is far from the wild west end and filled with people of all ages; I would call it sophisticated. I will return to Ibiza, all being well and as we sipped Strawberry Daquiris in the fading sunlight to the sounds of a chilled out remix of U2's 'With or without you' we talked about 2013, giving it some time to save the euros first! Apparently being twenty now, means that we are old, as every day we seemed to talk a little bit along the lines of 'when we've all got kids' or 'when we're all married' or 'on my hen weekend we're going to come to Ibiza!' (true story) Scary stuff. We had fun dressing up nice every night and during the week had scoped a destination for a classy meal to end the week. On our last night we returned to a lovely restaurant where we embraced spannish culture with seafood paelle and sangria. During the daytime, always hot and sunny, we visited Eivissa, Ibiza town, and took reasonably priced on time busses to the nearby beautiful beaches of Cala Bassa and Cala Comte, enjoying swimming in the sea, completing cross words and arrow word puzzles together on the beach. Alison and Nicola headed up the 'Melon Head' project = large water melon + vodka + left to infuse on the balcony for a few days = really strong, disgusting in places, vodka flavoured melon a bit past it's best... Despite us one morning getting in at 6.30am with a chinese takeaway then getting locked out of the apartment (possible low point of my life) we realise we are not rock and roll in the slightest. We are the ibiza softcore massive - stopping off for a long craved cup of tea on the way home from a night out. Having been pursuaded by some workers selling on the beach, we got tickets to an aqua party held at club 'Es Paradise'. Arriving at 5am, apparently late after some missunderstanding, Hannah and Alison had to sweet talk our way in where the party was not yet under way. What followed I could barely believe! Clearly risk assesment is not a thing in Ibiza. I felt like Noah when water both fell down from the ceiling and seemed to spring up from the floor, until we were essentially in a swimming pool up to our waists...good job the beloved blackberry had been left behind! To put the risk of death into context, all of the surfaces inside the building are made of marble, and the four or five steps down onto the dancefloor are absolutely massive. Everyone around me seemed somewhere on the scale betweeen moderately merry and absolutely paraletic - certain death seemed on the cards, before I even had time to consider the risk of electricution as the disco tunes pumped and an electric chandelier dangled right above our heads. One particularly horrificly drunk guy kept climbing up the stairs and propelling himself off into the crowd. For a very uncomfortable few seconds I genuinely thought I was going to watch someone die as for a while he appeared to be floating face down in the water after hitting his head on the floor as his friends drunkenly failed to recognise his state. Thankfully he emerged, a bit drowny, but survived to continue his idiotic behaviour. So that was an experience. We emerged before the end of the party, wet, bemused, a bit cold and el groucho, in partial disbelief and in search of a full english breakfast. All in all, we had a great time, dancing on bars, swimming in the sea, attending trendy club nights with high price entry fees and dreaming about the days to come when drinking coctails costing 9 euros will be the norm. We didn't stick around for David Guetta at Cafe Mambo because we were too cool, but were totally sold on a tour night called 'TasteIbiza' where the hosts treated us to a great value for money VIP bar crawl including a three course meal and we met Magic Steve, a Derren Brown style mind reading magician who even impressed my very skeptical self! We went to SPACE, an award winning Ibiza club which was so genuinely amazing I didn't even resent the extortionate ticket price. On the down side, we had to pitch in for a bottle of water, costing 7 euros! This nearly made me cry. Whilst representatives kept trying to sell us tickets for various escapades on the basis of their popularity and entice us into bars packed out with people, 'but we only like us' was the standard, jokey yet perhaps slightly rude, but round about accurate excuse given. 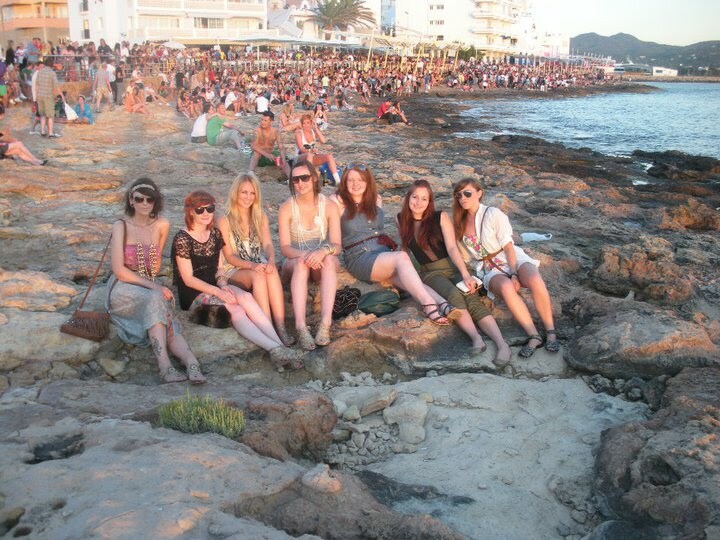 Because my favourite thing about Ibiza 2010, despite it's beautiful sunsets, beaches and ridiculous nights out, absolutely has to have been spending so much time, chilling, chatting and catching up with some of old my oldest and best friends from Groby!